Halfway between Mingus and Stephenville is, well, pretty much nowhere. 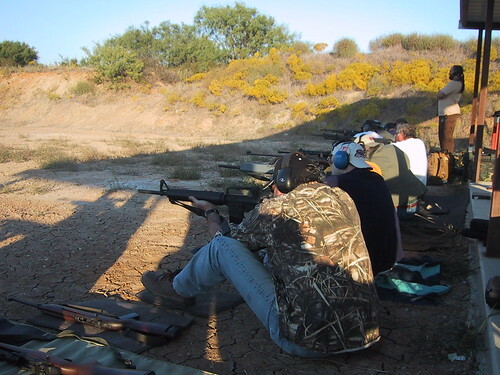 But situated nicely in the middle of nowhere is the Tac Pro Shooting Center, where the Mad Oilman and I spent the weekend (mostly on our bellies in the dust) learning a lot about firing rifles. The trip was not without its scenic rewards. I haven't the faintest when the last time I saw a sunrise was, but Saturday morning's was magnificent. 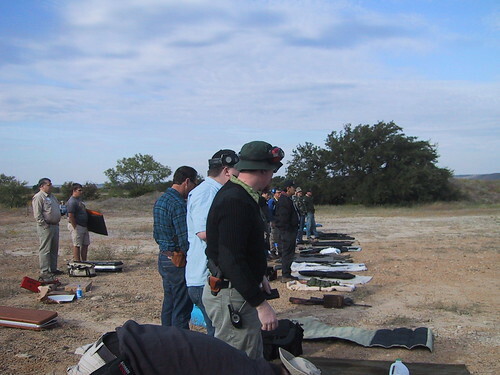 We had about 35 people on our range, although we split into smaller groups later on. 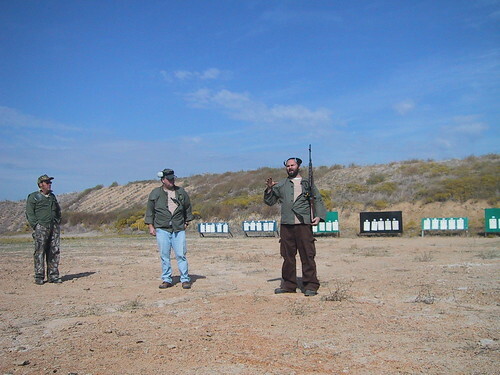 We started at 25 meters, firing sets of three "zeroing" or "sighting" shots. The point here was to adjust your sights based on the centers of your groups, but calling my results groups would have been overly polite, so I just left things as they were. 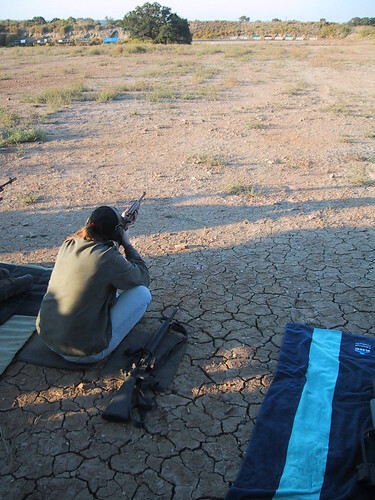 Then we went through a series called an AQT which involved shooting standing, sitting, and then prone, at various targets, with rules about how many in which target and timing and all sorts of stuff. Having never shot my rifle except from a bench, the whole process was so bizarre that I was happy to hit the paper at all. We scored these results and called that a baseline. There's a minimum score under which you are rated a "cook" (as opposed to a rifleman) and I figure I came in somewhere on the order of waitress or busboy. Throughout the day, we learned about the different shooting positions, how to use a sling, shooting by the numbers, and we shot and scored and shot and scored. Periodically we'd move further back down the range, re-sight, and shoot some more. 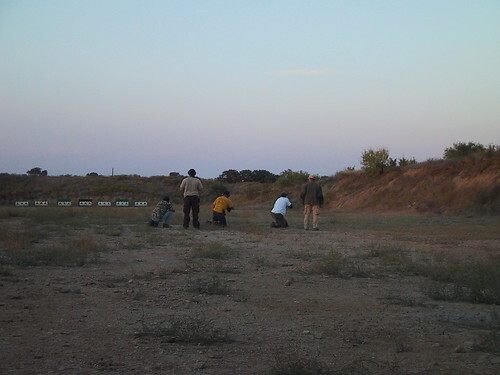 By the end of the day, we were back at 200 meters, and those targets look pretty darned small by then. Somewhere along the line we shot another AQT to compare to the baseline, and I think most people went up but my score went down. The last exercise of the day involved squads of three shooters moving and shooting. 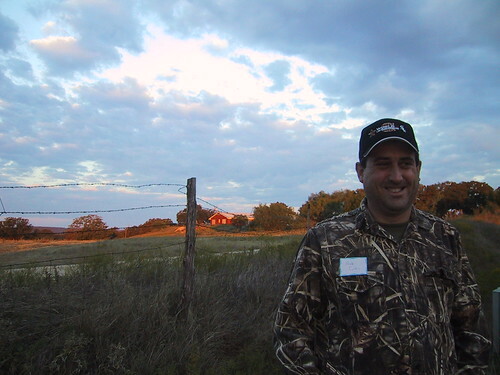 They started at 200 meters and shot five rounds. Then they all get up and move down range a bit. Stop, get into position and shoot five more rounds. Move closer, repeat, etc. til you've shot 20 rounds. From the back of the range, it looks like they're just strolling along, but when you actually do it, it's surprising how much your heart rate goes up, and how long it takes to settle into position and calm down enough to shoot. I went back to the 25 meter range with one of the instructors and we went through several sighting rounds and a lot of questions and another AQT. I still didn't make it out of the cook's category, I don't think (we didn't score it), but I hit at least one of the targets in each of the prone series, which was a first, so I called it progress. I did get to the point where sometimes I felt like everything lined up in the same place as before (I have a real problem with this in all my shooting--it is very hard to reproduce a given stance, so it's hard to know how to "do it just like that next time!" when it does work--which is where that "it's all kind of random" comment from above comes from) and I even called a shot (I knew it was high and right) although I don't exactly know why I could call it, and it was only once.